The generosity of volunteers and donors in giving their time and money to good causes allows charities, non-profit organizations, foundations, educational institutions, booster clubs and others to continue their own good work. The good will and consideration of these volunteers and donors should in some way be recognized and rewarded. After all. if not for their donations, critical needs would likely go unmet. That’s where Signs of Gratitude, a division of Patterson Design, enters the picture. Words alone cannot always express your gratitude for a donor’s generosity. A custom sign is a heartfelt way to show your appreciation for their support. Working under contract with a variety of organizations, we provide handcrafted custom plaques to express thanks, commemorate a good deed or acknowledge a significant gift. Our signs are handcrafted in the USA, not mass produced. Each sign is decorated and finished to yield an antique and aged plaque with a routed edge. What better way to say: You make a difference. To accommodate a variety of requests, we produce signs in two styles: Athletic Broadsides and Points Of Interest. Custom requests are also welcome. 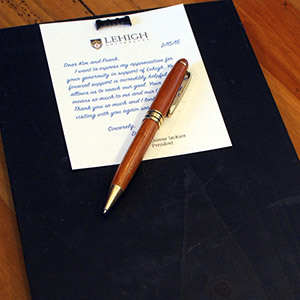 Handwritten notes can be a meaningful expression of gratitude. We allow space on the back of each plaque to personalize a message under your logo. Each of our plaques are exclusive to your brand and can be found nowhere else. We take great care to craft each one with a message that resonates with each organization or institution. © 2015 Patterson Design. All rights reserved.